The opening date for the new Cameron County Events Center has been pushed back to the month of September. 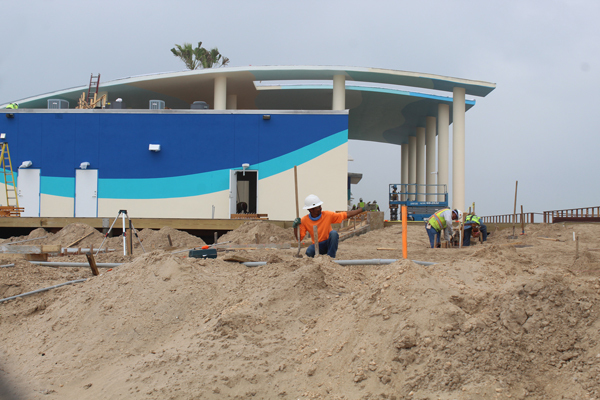 The project has been under construction since February 2018 at Isla Blanca Park, which is the flagship of the county’s parks system. The multi-million-dollar center will provide a place for multiple activities such as concerts, receptions, school programs as well as viewing for fireworks and rocket launches for Space X which has been building a facility to the south on Boca Chica Beach. A groundbreaking was held last February 2018 and was to be completed later in the year. However, county and officials in charge of the project decided to postpone the opening because additional space and a more seating areas had to be added to the existing facility. Sofia Benavides, commissioner with the county’s Precinct 1 which covers the Island, said a completion date of September of this year is being proposed. Besides the events center, there is the amphitheater that can accommodate several thousand spectators. The park’s project is being funded from money collected from the Island’s hotel-motel and from rental motor vehicle taxes.